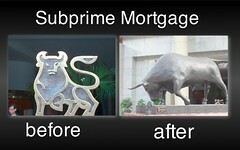 The Merril Lynch logo after the subprime effect. The statue on the right was commissioned in June 2008, sculpted by Anna C Spelling. I wonder whether the CEO knows about the real meaning of the bull’s limping head.